Building strong abs takes repetition (multiple sets), variation (you’ve got to build the entire core), and patience (you’re not going to build strong abs in one weekend). Building defined abs is the next level, which includes the addition of regular workouts (6 days a week), determination (almost never miss a day), motivation, and diet (salmon salad instead of burgers). But once those muscles start to peek out from under your skin you’re still only halfway there. The next level in abdominal training is building definition and striation within the individual sections, including your upper abs, lower abs, obliques, and overall core. But even if you can’t quite see your abs now, there are many benefits to working your entire core as a package deal. A strong and well-developed mid-section protects your back, internal organs, and reduces the chance of other injuries, including a hernia. And once a proper set of abs is achieved (whether you can see the result or not), you are only a certain percentage of body fat away from attaining a true “six pack shortcut“. 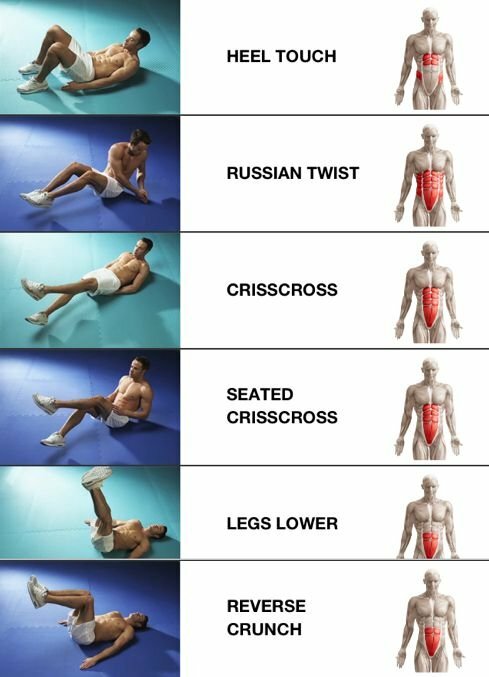 In other words, it is much easier and quicker to define your abs once the groundwork has been laid underneath than it is to wait until your diet comes together and then target the individual ab sections. And building the midsection properly does not have to be a chore that involves countless exercises and reps. In fact, you can get a Men’s Health front page quality set of abs with only 6 exercises, 3 sets, and anywhere from 20 to 50 reps each.